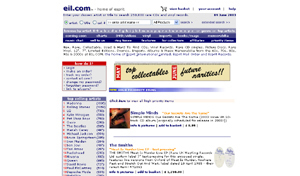 The official site. Includes Jim's diary and thoughts, exclusive audio and video downloads, bundle offers, ticket offers and more. The official shop. 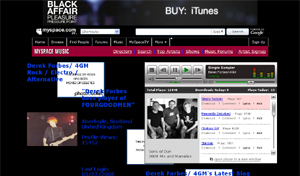 New releases, music, clothing, DVDs, Blu Rays, Personalised Awards, Canvas Prints, Tour Merchandise and more. Celtic legend Jimmy Johnstone's official site. You'll find an interview with Jim here about the charity single Dirty Old Town. 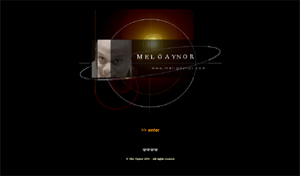 Mel's new site features news about the man himself, his gear, a biography and all the current news (including Light Of The World and The Fusion Project). Mick MacNeil's should need absolutely no introduction. And for those unfamiliar with his solo work, the sublime Berlin Blitz can be heard, along with some Simple Minds and FourGoodMen favourites. Derek Fobes should need absolutely no introduction either. 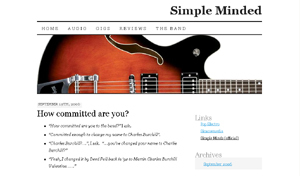 His site includes demo tracks from the earliest days of Simple Minds (such as Chelsea Girl ) and the latest Sons Of Dan material. 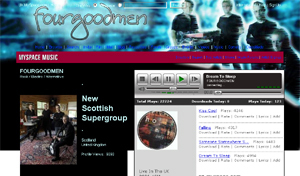 Derek Forbes' blog includes thoughts about his new project www.afewgoodmen.info, pictures, background, biography and more. 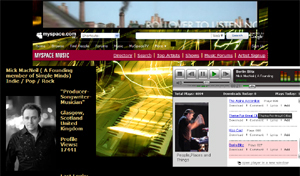 Mick MacNeil's site features pictures of his home studio, information about his own label, and a few sound files to download. You can also purchase People Places Things , the first solo album by the much missed keyboard player. 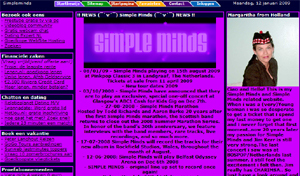 New and frequently updated website featuring loads of pictures of Simple Minds collectables and goodies. Run by Wolfgang and Andreas. 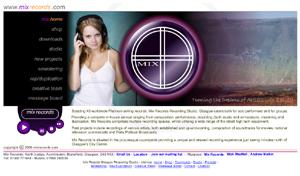 Excellently designed website with lots of content. Whilst the core of the site is devoted to the Minds' live shows, you'll find a lot more besides on this comprehensive site. 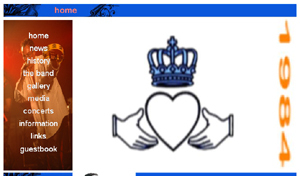 This is the site for French fans; at the moment, most of this smartly designed site is under construction, but it's home to a lively and interesting French forum. Alexander Gerhards' site revolves around a graphically intense inventory of his collection. 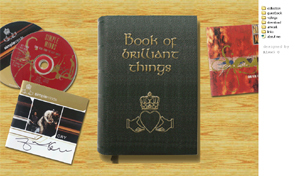 Additional items include a guestbook, screensaver and wallpapers. 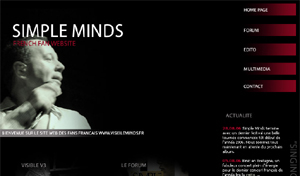 A fans' page for fans, Alexa Dubreuil's french site features their own Simple Minds inspired artwork, stories and pictures from various meet-ups. There's also an interesting page on the design of Bonnie Wee studios, the band's "Gang Hut" from 1988 to 1998. 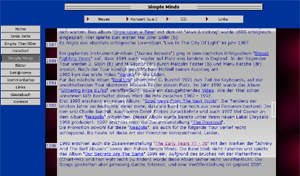 Enthusiastic German fansite with news, biography, discography and concert information. Paola's site features lots of tour pictures from 2002 through to 2004, and video captures from the 1970s through to the present day. Formed in 2004, this new tribute band already has the Etten-Leur Hacel Festival under their belts. History, band members, gallery and all-important upcoming gigs are all included on their site. 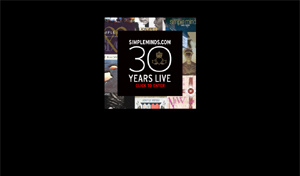 Swedish cover band dedicated to Simple Minds but also Depeche Mode, Frankie Goes To Hollywood, Bowie, Pet Shop Boys and others. 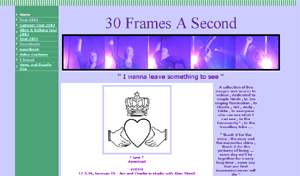 The site features their versions of Waterfront and Alive and Kicking . 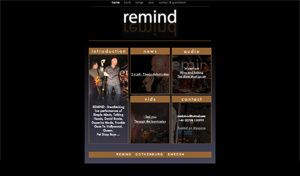 An on-line blog outlining the creation of a new Simple Minds' tribute band. So far, the first members of the group are being found, and demos are starting to take shape. Yet more downloads, including the popular Liverpool Kings Dock from 2003. Esprit have the latest releases, through to the earliest, plus lots of weird and wonderful collectables. I've used them for years - and personally recommend them highly. From the normal, commercial offerings through to the ultra rare, there's always something of interest on eBay. 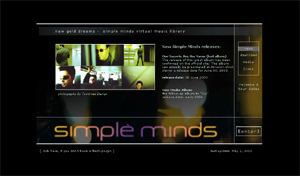 This site offers a good range of deleted Simple Minds CD Singles - complete with track listings and pictures. 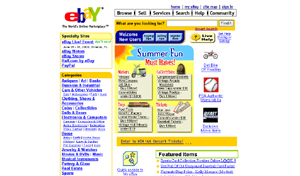 All can be ordered with the secure online shopping cart.